My friend Jenna told me about these the other day and I had to pick up some when my current pack ran out. 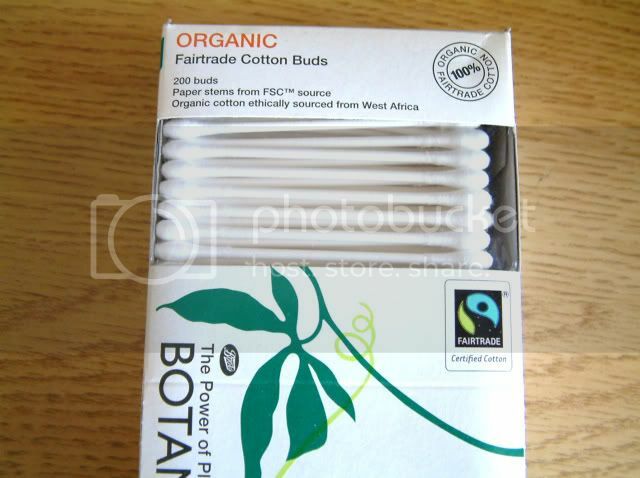 From Boots' Botanics (The Power of Plants) range, these cotton buds are not only made from organic and fairtrade cotton, but they also have paper stems instead of plastic ones which makes them fully biodegradable. As a light user of cotton buds (I mainly use them for cleaning up nail polish and correcting eye make-up), I don't mind paying a bit extra for these (I think they were about £2 for a pack of 200), but can see how the price may put some consumers off. Either way, I'm happy that an alternative like this exists and I'll continue to buy these. If you purchase 'green' products like this, how important is the monetary cost to you compared to ethical/eco factor? Will you pay extra for green products? I only use cotton buds to correct eyeliner/nail polish mistakes so if I was going to need more in the next five years (unlikely) I'd probably get these. I can see that if for some reason you used them a lot (ie for applying eye make-up...cringe) then cheapness could be more important, but if I was a big user of cotton buds I'd probably feel more guilty and thus be more likely to buy these! @Julianne - yeah that's how I feel; if you're a big user then you have more of a social responsibility to buy these and if you're a light user, then you can also justify the extra ££s.